I feel sorry for stir fries. They’re the quick and easy dinner equivalent of vanilla ice cream. Predictable. Basic. And not that exciting. Basically, they’re just not tacos. There, I said it. But, clearly, stir fries are a solid choice for dinner. Quick, easy and healthy. Plus, cook them right, and they can be super YUM! And I should know. 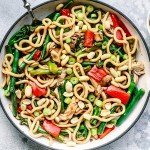 It took me ages to find a stir fry recipe I really loved. One that ticked all the boxes. A recipe that I could make time and time again and not get sick of. And that recipe? My Easy Sugar Free Kung Pao Chicken. Haven’t heard of Kung Pao Chicken? Well guys, Kung Pao Chicken is to Americans, what Lemon Chicken is to Aussies. A Chinese take away favourite. Why so good? Think tender chicken coated in a thick, spicy, sweet and sour sauce. It is everything, to everyone. Still on the fence? Kung Pao Chicken is topped with crunchy roasted peanuts. Sealed the deal, didn’t it? 20 minutes. One pan. Minimal mess. Minimal fuss. Kinda healthy, thanks to 3 hits of veg. If you don’t like my choices, choose your own. Want less Pao and more Kung, deseed the chilli or leave it out altogether. Udon Noodles. Thick, chewy, pasta clones that are absolutely delicious. Convinced my Sugar Kung Pao Chicken is worth a try….YES/NO? If you give it a shot make sure you let me know what you think. All the taste of the Chinese classic minus the sugar. 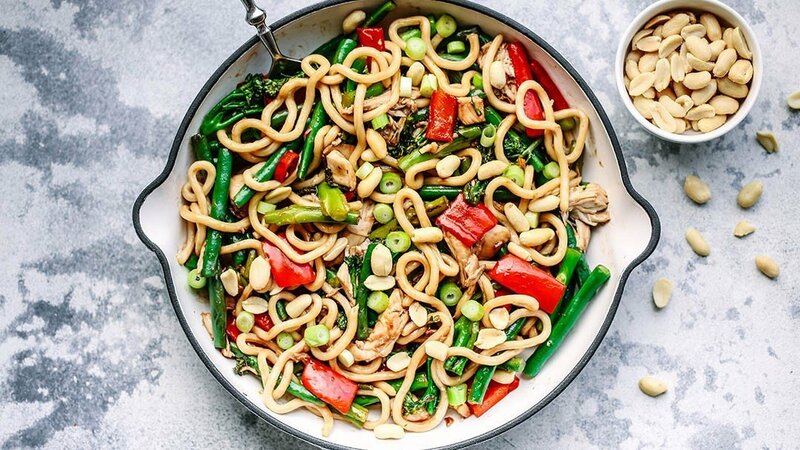 With tender chicken, thick noodles and a flavour packed-sweet-sour-spicy- sauce, this Sugar Free Kung Pao Chicken is seriously delicious. Finely chop the garlic and chilli. Next, remove the meat from the chicken, cut the ends off your greens beans, chop the broccolini into 4cm pieces and deseed and slice the red capsicum. Set aside. Heat the sesame oil in a large frying pan over medium high heat. Add the garlic and chilli and fry for 2 minutes. Add the beans, broccolini and capsicum and cook for a further 5 to 7 minutes, stirring occasionally, until the vegetables are tender but still crisp. Meanwhile, in a small bowl whisk together the water and corn flour. Add the chicken, soy sauce, rice wine vinegar and rice malt syrup/honey to the frying pan and stir until combined. Next, stir the water and corn flour mixture into the frying pan and bring to the boil, then reduce heat back to a simmer. Finally, stir in the noodles and cook for 2 minutes, until warmed through. While the noodles are cooking thinly slice the spring onions. 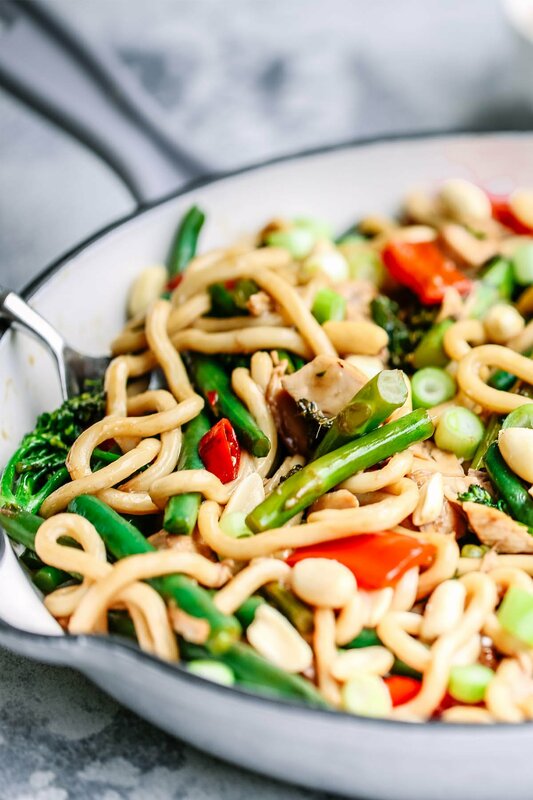 When ready to serve, divide the noodles between two bowls and scatter with peanuts and spring onions. Save time. Throw in a bag of ready to use stir fry vegetables, instead of chopping your own. 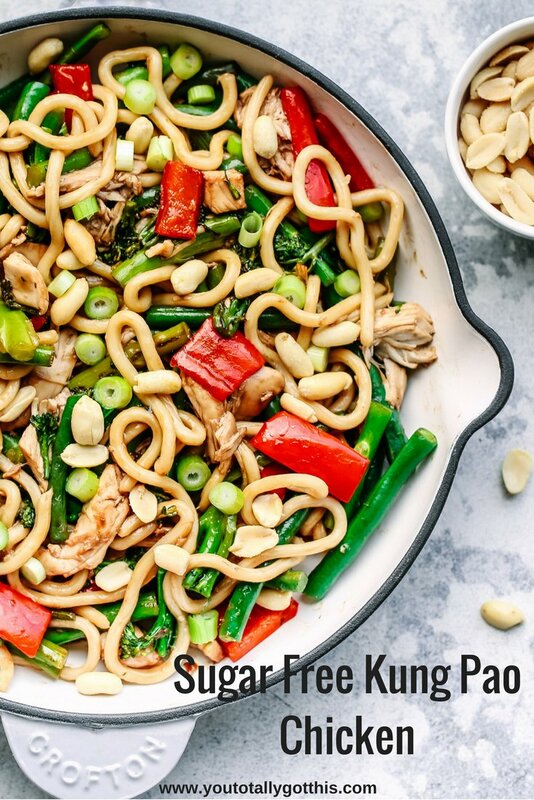 P.S – Want a whole weeks worth of dinners just like this awesome Sugar Free Kung Pao Chicken? Grab your FREE quick and easy weeknight dinner plan right here. I’ve been thinking about doing a series of things you can do with the humble roast chook! And this delicious stir fry is a great one! Making your own sauces is such a good idea. I actually prefer the taste to packaged ones and you get so much less sugar! Roast chooks are one of my life essentials! I pretty much never cook chicken, EVER! And can’t agree more about the sauces – until I did the I Quit Sugar program, I had no idea how much sugar was in supermarket sauces. I love making my own now and it’s super easy. Thanks so much for stopping by to check out the recipe Cassie. Look forward to getting some ideas from your roast chook series.